This entry was posted in mixed media and tagged art, Christmas, design, ink, watercolor, watercolour on December 24, 2013 by Anna Cull. Today’s Shoot it, Sketch it is yet another experiment. The inspiration was a photograph taken at our back door last April. Something about the dry, curly leaves and the tiny, creamy white petals really appealed to me. I painted it three times ― twice with brushes (above) and a third time with a palette knife (using the leftover paint for the background) and acrylic paint markers (below). Then I combined the three paintings in Photoshop and tweaked a few filters to create the series below. This entry was posted in mixed media, photography and tagged abstract, acrylic, art, autumn, creativity, drawing, painting, Photoshop, seasons, Shoot it Sketch it on October 21, 2013 by Anna Cull. For this project we had to use found images and a limited colour palette to design the cover of a book about the beat poets. 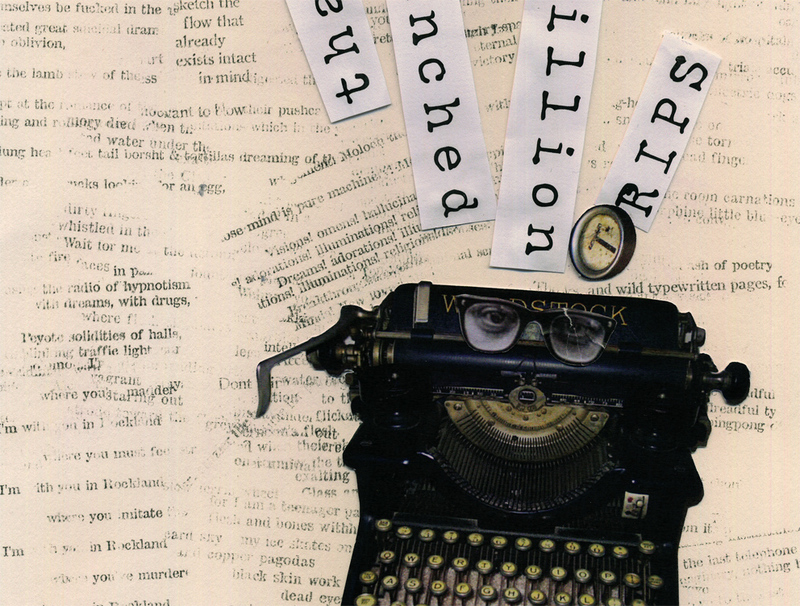 My cover is a paper collage of photographs, censored texts and deconstructed poetry. The background features excerpts from the works of Allen Ginsberg, Jack Kerouac and William S. Burroughs that I have retyped, rearranged, printed, torn into pieces and transferred on to paper using an acetone printing technique (the same technique I used for my book without boundaries). The acetone transfer produced a wonderful, imperfect, aged sort of effect which you can see in more detail below. The diary pages are from a journal I put together for my Design & Arts College exhibition in 2012. Two years of research, ideas, word maps and sketches had to be reduced to a mere 72 pages. It was no easy task but I now have a beautiful, professionally bound diary that I’ll always treasure. This entry was posted in mixed media, sketchbooks and tagged art, creativity, design, drawing, exhibitions, illustration, ink, journal, poetry, printmaking on June 28, 2013 by Anna Cull.